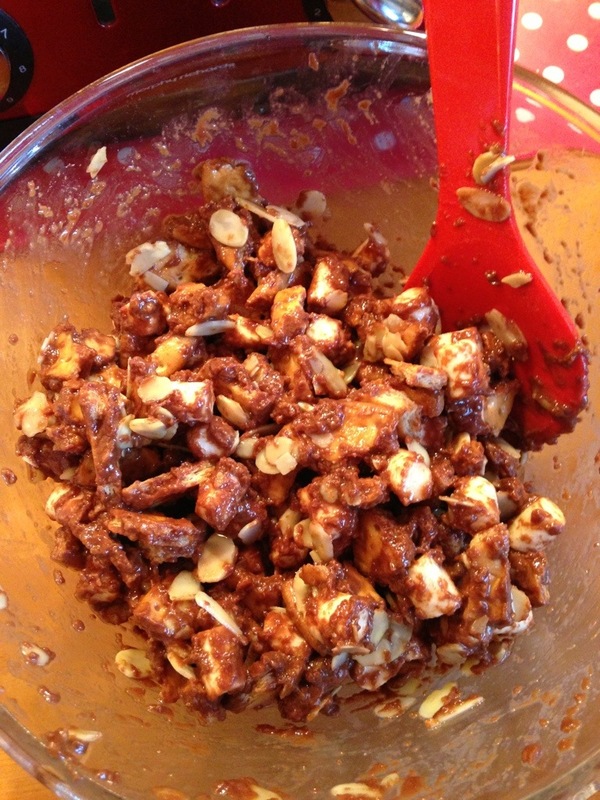 So this weekend I attempted to make rocky road but it didn’t really go according to plan! I’ve been wanting to make rocky road for ages as it’s one of my favourite snacks and shock horror I’ve never made it myself! Incredible, I know. Anyway with a relatively quiet day ahead of me I gave it a whirl on Sunday but sadly the chocolate to filling ratio wasn’t quite correct so the finished bites look a little sad and anaemic. But they taste scrumptious though so I suppose that’s half the battle! Like I said my version didn’t really have enough chocolate mixture so I would do 50% more syrup, butter and chocolate. But I suppose you can amend that as to how chocolatey you like rocky road! Lau and I have just returned from Portugal where we spent a very relaxing few days with friends! Whilst there we had a fantastic time, despite torrential rain, and ate lots of scrumptious food. One of the great things about going to Portugal fairly often – twice this year – is that we get to revisit favourite restaurants and enjoy some delicious Portuguese delicacies, so I thought I’d share some of our favourites with you all. The good thing is that a lot of our favourite Portuguese food we can have over here as there’s a great portuguese deli five minutes from our house, but somehow it’s not quite the same and tastes miles better when you’re basking in the portugese sunshine. Sumol – sadly this is a drink that’s not really made its mark anywhere but Portugal. It’s a fizzy orange, that’s not acidic or too fizzy and it has a brilliant texture as it has pulp in. So way nicer than Tango or Orangina. Sandbanks – this restaurant overlooks the beach in Vale do Lobo and does delicious food. Everything from fresh fish and ciabatta to huge salads, hot wraps and potato wedges, all of which are scrumptious – I defy anyone to find a better tasting club sandwich! This year it was out first port of call on Thursday lunchtime where Lau and I enjoyed a tomato and mozzarella ciabatta and a chicken, bacon and avocado wrap with potato wedges respectively. Chocolate sandwich biscuits – I’m sure that’s not the correct name for these scrumptious biscuits, but that’s the one I’m using. With their creamy chocolate crème sandwiched between two crunchy biscuits I find it impossible to say no to these biscuits, and have been known to eat five in one sitting, oops!! Maria’s – another restaurant overlooking the beach, but this one is more of a beach bar and a much more recent discovery as it’s recently changed hands. I’m a big fan of the salads at Maria’s although the tempura prawns and prawn curry are also legendary, well at least in our family! Birthdays, who doesn’t love them? I love everything about them, from the build up and expectation to the actual day itself with the lovely presents and the friendly people. But perhaps the thing I look forward to the most about the day is the cake – no surprise there, hey? In our family you always get a home made birthday cake and when I was growing up I was always excited to find out what that years cake was going to be! Over the years I’ve had a pink My Little Pony castle cake (constructed with four swiss rolls), a teddy bears picnic cake and my all time favourite one a humpty dumpty cake which included an easter egg Humpty Dumpty on a ‘brick’ wall made of different coloured cake! What can I say? My Mum is a genius when it comes to cake construction! Although there was this one year, which I prefer not to remember as it was so painful, that not only did Lau and I not have our own cake, but it was also a shop bought one!!! You should have heard the guilt trip that Lau and I gave Mum that year, I do feel a little bit bad about it now, but hey it worked and the next year we each got our very own home made cake! Anyway back to the point of this post, and that’s the birthday cake that we made Mum over the weekend. Unfortunately we couldn’t be there for the actually day itself, but we made the weekend extra special by all getting together to celebrate and of course cake was apart of it! We got the idea of the Giraffe Cupcakes from a post Lau saw online (which annoyingly I can’t find) and thought this would be perfect as Mum absolutely loves Giraffes, they are her all time favourite animals. Also a cake made out of cupcakes meant we could divide it up easily when we all left for the weekend – although we made sure to give Mum the majority of them, it was only fair as it was her birthday after all! Anyway, back to the cake itself. We used the recipe from my Great British Bake Off Pink Show Stopper Cake, as it’s so delicious and super moist and scrumptious. But rather than colouring the sponge pink, we went for good old plain sponge. We cooked the cakes for about 15 minutes rather than the usual 25 until they were perfectly cooked and then slathered them in Betty Crocker’s vanilla buttercream icing (which when you can’t face making it from scratch is the best shop bought icing ever)! And then all that was left was to decorate with buttons and black icing and lay them out to form a giraffe, and doesn’t it look fantastic? Mum was certainly pleased about the cake, she was certainly grinning from ear to ear when we gave it to her!! 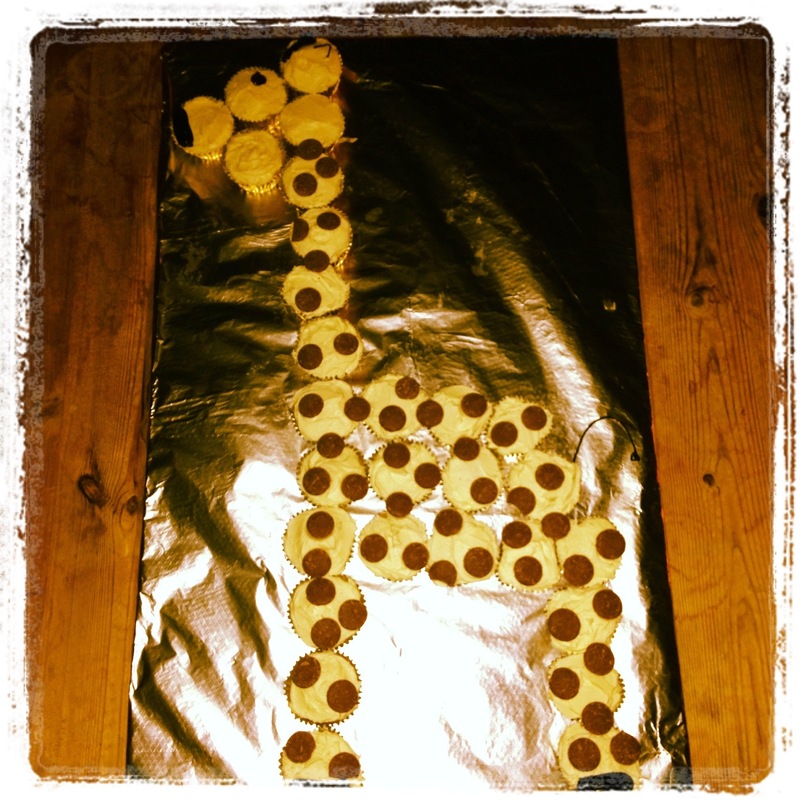 So there you have it, how to make a giraffe shaped cake for the Mum that loves giraffes like I love cake! I only wonder what other shapes you could make out of cupcakes…..
I’m sure you’ll all remember the Gingerbread biscuits that we made last year, if not take a look here. I’ve been making these for my work colleagues every Christmas for the last 5 years and I’m already being asked about when they’ll be making an appearance this year – no pressure then. Now all this talk about Christmas baking got me thinking about what else I should make that is Christmas themed. I’m a Pinterest fan and my biggest board by far is my ‘edible bits’ board, although the Christmas one is up near the top too. So my plan this year is to make as many of these Christmas recipes as possible. So I thought what better way to start, than to share my favourites on here. So here we go, here are (some) of the Christmas themed bakes that I’m planning in the next couple of months. Do you remember last Christmas when I made whoopie pies (take a look here)? I loved them, in fact everyone loved them – family friends and work people. So this year I’m all set to make them again, but with a twist. I’m going to sprinkle some Christmas magic over them with the decorating, you see I plan to make Christmas Pudding Whoopie Pies. With a chocolate filling to sandwich the cakes then topped with a white icing and miniature holly leaves cut from fondant icing, the perfect little miniature Christmas Puddings. Take a look at these lovely cookies, Peanut Butter Reindeer Cookies, to be exact from Bakergirl at buddingbaketress.blogspot.co.uk Don’t they look amazing? The fact that they’re decorated using mini pretzels and M&M’s just makes them all the more perfect for me. 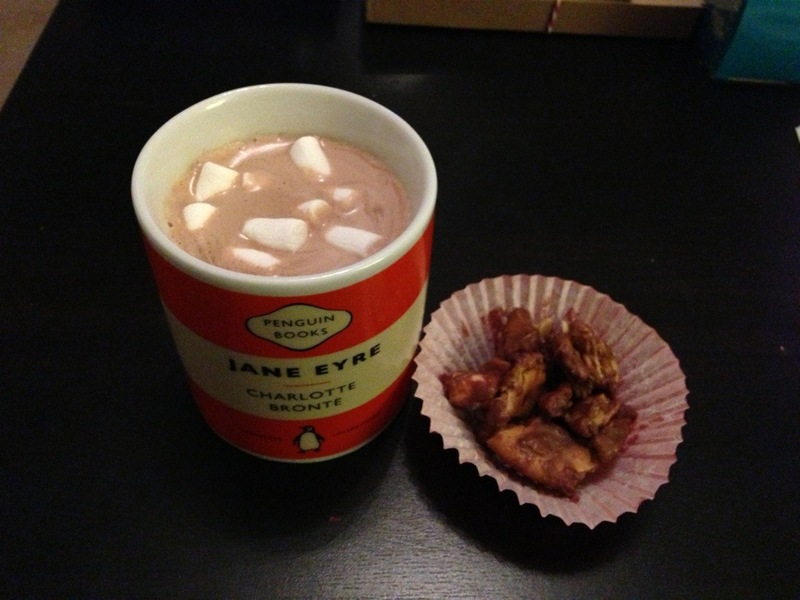 I think I might have to make these for the last week of work, to go with the Christmas Gingerbread biscuits perhaps? Next there’s this Chocolate Gingerbread Toffee cake. Isn’t it completely spectacular? It’s got chocolate, gingerbread and toffee – what more could you want in a cake? A bit too much for a small family Christmas with just five people, but maybe something to make for the Evans family boxing day gathering. With 13+ people I’m sure we can make a good dent in it! Don’t worry I’ll make sure I keep you updated on how they all turn out…. p.s. I’ve just realised that these are all cakes and biscuits! Clearly my sweet tooth is shining through. I’ll have to keep my eye out for savoury things too, but let’s be honest the only savoury thing anyone wants to eat at Christmas is turkey with all the trimmings, and there’s no way I can improve on the Evans turkey lunch. I love a holiday as it’s always the perfect excuse to cook scrummy dishes and eat lots and lots. There’s nothing better than the excuse of baking something special, be it an Easter hot cross bun and butter pudding or a Sherry Log at Christmas, but strangely enough Halloween isn’t one of the holidays that I really get. Maybe that’s because it’s so new over in the UK, so I’ve not grown up experiencing it, but it really does seem to pass me by. Don’t get me wrong I do buy chocolates for passing trick or treaters and I get waylaid by the promotional items in Sainsbury’s – these Frankenstein Fancies are a case in point – but I don’t really ever celebrate by baking or cooking other Halloween treats, although last year we did make chocolate chip biscuits shaped like ghosts! Anyway this year we decided to make a mound of gingerbread biscuits, not for the trick or treaters but just for us and friends. We even got out the Halloween biscuit cutters that we picked up last year from ASDA so that we could make biscuits shaped like bats, tombstones, pumpkins, cats, bats and even a haunted house! 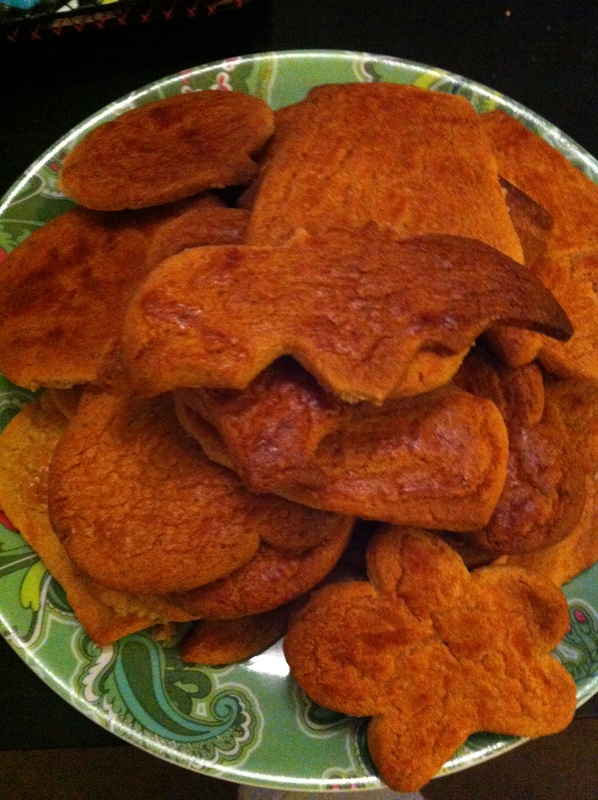 It was lots of fun and the biscuits were tasty, but I’m not sure I’m sold completely on the Halloween baking. But perhaps that’s because gingerbread is more a Christmas recipe that Halloween, maybe if we’d made some toffee apples, spooky cupcakes or a graveyard cake I’d be feeling quite different. Hhm maybe that’s worth investigating for next year. If you have any suggestions on what we could make for next Halloween let me know in the comments below and who knows next year I might include the recipe on the blog!